This is the twelfth in a series of blog posts discussing major figures in film and literature, based on the Major Arcana of the Tarot. I'll be using the 21 Major Arcana of the standard Rider-Waite-Smith Tarot deck. For some more background on the deck's history and its elusive role in popular culture, see this post from HiLowBrow, which is a good primer on the Tarot, and pretty fascinating in its own right. Werner Herzog is a strange cat, and a strange attribution for the Justice card. So much of what happens in his films -- in Stroszek, in Heart of Glass, in Fata Morgana and Wild Blue Yonder -- just seems random, and radical unfairness seems to be sort of a theme. Yet, in their otherworldly impulses, Herzog's films do have a sort of cosmic balance to them, and this is the logic that orders their chaotic surfaces. 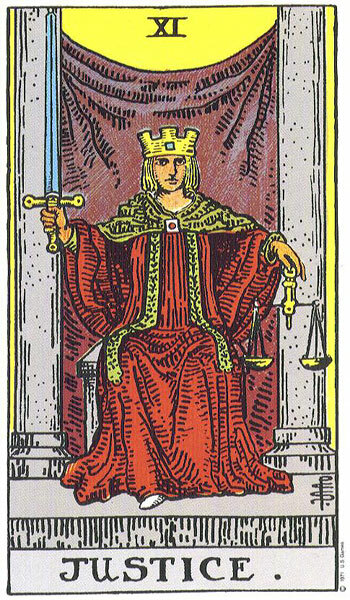 Justice, the Major Arcana, is not Judgement. That one's later in the stack. Justice doesn't represent retribution or the hand of vengeance falling upon doers of evil. Rather, Justice is one of the Virtues, along with Strength and Temperance It is reason and detachment, the capacity to observe and assess a situation. It is balance and accountability (the symbols to the right and left of the figure in the illustration); it also takes on certain stern qualities like coldness, insensitivity, and severity. Among Herzog's best-known documentaries is Grizzly Man, and it is one of cinema's most compelling documents of antagonistic justice building a bridge between Nature and Man. It is a film about Timothy Treadwell, a young, naive environmentalist who gets into the annual habit of traveling into a remote Alaskan forest to become one with the wildlife. Treadwell was one of the staunchest advocates for bears, and he came to know them better than he knew the human community that surrounded him. In the end, Treadwell grew paranoid and obsessive, and he overstepped his bounds, remaining in Alaska during a period of stress and scarcity. In no time at all, one of the enormous bears in the forest restored order, killing and devouring him and his girlfriend. An unhappy conclusion to an erratic life, but there was a great deal of justice in't... a restoration of the true natural order, even as the radical difference between man and beast was reinforced. 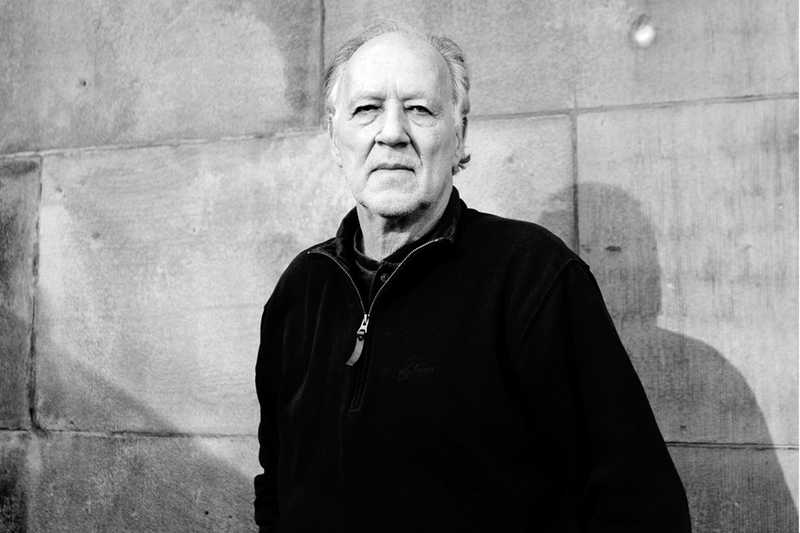 There is a similar nihilistic sense of spiritual equivocation in all of Herzog's films. His cult classic, Aguirre: The Wrath of God, is about a conquistador who plunges into delusional hubris as he infiltrates the Amazon rainforest. A dark cloud grows around him, his crew assaulted and dying of disease, his path hindered by natural disasters; yet, these hardships only strengthen his resolve and his madness, until finally he is consumed in the self-destruction that he spent the whole story courting like a diseased lover. Or take Klaus Kinski's other Herzog triumph, Fitzcarraldo: an aristocrat dreams a hopeless dream of building an opera house in the jungle; in pursuit of this desire, he orchestrates a grand, dangerous, opportunistic plan to harvest rubber from hostile native territory. He defies every warning and dissuasion in turn, until at last, by a monumental effort of will, he manages to transport a steam ship over a mountain to reach his destination. Having accomplished this impossible task, he finds his narcissistic vision crushed by the hostile will of nature, and he is left with only his own senseless accomplishment to accompany him home. Honestly, it's hard to cover all the man's films. Is there a sense of Justice in Stroszek? At the very least, there seems to be a sense of symmetry and order to the universe, a sense of inevitability that can't be cheated, however cruel it might be to the hero. It's cold, and it's severe, but it has lessons to teach: that justice itself can seem random, vicious, and petty, but it must be rigid and consistent, like the police officer who arrests Scheitz for petty theft, or like the towing vehicle that picks up the Germans' mobile home and repossesses it. Admittedly, Stroszek's justice is not karmic. It is cruel and unthinking, an otherworldly force that maintains the status quo, even to the detriment of hope and humanity itself. If you want karma, you have to go to Aguirre and Fitzcarraldo... and even then, it's not a kind or forgiving aspect of nature. That's what the card holds, and that's what we find in the evolving cinema of Werner Herzog... sometimes Justice serves an ethical impulse, turning karma back upon its offenders; other times, it simply upholds the impersonal balance of the universe, punishing the innocent and guilty alike, according to whatever rules bind them together.